Sir Thrift A lot: Funky Junky! 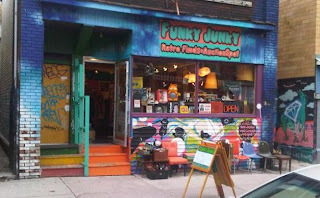 Funky Junky is one of my new favourite shops. It's here in Toronto in Kensington Market. Definitely has some amazing items, where they find them I don't know, & it's also a blast from the past. I've been in only a handful of times & have seen so much stuff I had owned growing up.. including gigantic New Kids On The Black pinbacks. They have a wide selection of vintage photography. My main collection of photography is found, not bought & I also would like to own a few post mortem photos. 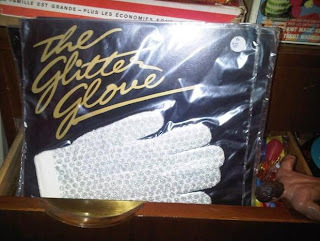 One of my favourite items from this stop - still sealed Michael Jackson Glitter Glove from 1984, the real deal, original. $8. Since it's my new favourite shop, I'm going to give it my own tag in the blog. recommended listing after reading this post: "Black or White" by Michael Jackson. OOo! I would love to see photos inside the store if they allow you to take pics. Sounds like a fun place! This reminds me of a few shops in Hollywood i love! But with the city comes a ton of overpriced "Vintage". i wish i could fly over to Toronto and see this one for myself! I would love to visit that shop. I am finding that most shops here just have junk. My son would be over the moon for that glove! This shop is definitely cool & this one isn't as overpriced as many of the others! I wanted to take some pics inside, but was too shy to ask. Next time I go I'm going to ask though. The time to be happy is now! From the vaults: Thirst Aid Glasses! ipath Footwear Giveaway @ Simple Finds! It's the weekend, have fun! My Fire King cherry has been popped!